Challenge #10: Create a memory today with someone you care about that will mean a lot 10 years from now. I love the idea of surprising people, but I’m usually no good at it. I think I did all right today, though. Since Mother’s Day is this weekend, I wanted to surprise my mom somehow with something. This morning I cut my run short so I could run (well, drive actually) to the store to pick up donuts (bakery shop donuts – I wanted Krispy Kreme but I couldn’t find them, darn it!) and a red rose. I took them to my mom at work this morning before heading off to work myself. 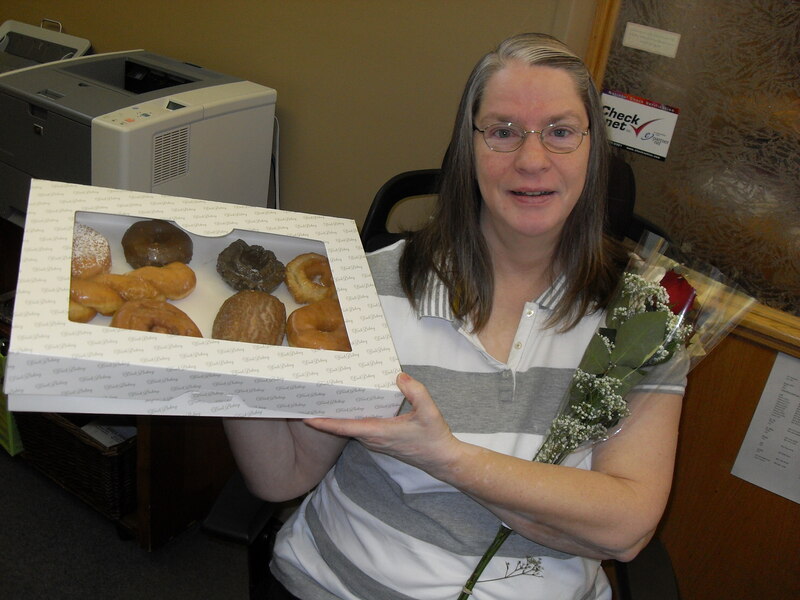 I told her she could share the donuts with the women in the office – but not the men because it’s not Father’s Day 😉 The rose, however, she didn’t have to share – it’s just for her. My mom isn’t one to get too excited, but I could tell she was surprised and happy. I don’t know how much it will mean in 10 years time, but I think that surprises always leave a lasting impression. My hope is that she’ll dry out the rose and keep it for 10 years, then she’s sure to remember! I’m a quarter of the way through The Escape Plan Challenge! This all may be going by too fast for me. I was thinking about this in the shower as I contemplated my rubber ducky. What do I do when I’m done with the challenges? Do I start over again? And if so, do I continue blogging about it, or will it be old news? Or if I don’t start the challenges over again… then what? What’s my next adventure? Well, I have 30 more challenges before really having to make a decision, so I guess I’ll cross that bridge when I get to it. Posted in Mental Health and tagged adultitis, humor, inspiration, mental health, mother's day, wellness. Bookmark the permalink.